If you thought the S&W Performance Center was just for limited-run handguns, you should think again. While waiting outside the office of Tom Kelly, director of the Smith & Wesson Performance Center, I occupied my time by watching the men working in the machine shop. No matter where my eyes shifted, all of these craftsmen seemed to have a definite purpose in this area that surrounds Kelly's office. Some were sitting down, meticulously filing the slide rails of an automatic. Others were working at various machines checking tolerances, spot grinding or running inspections of orders ready to go out the door. Three representative guns from the S&W Performance Center; from left to right: the Model 945 Two-Tone in .45 ACP, the author's customized Model 25 .45 Colt and the Model 952 chambered for the 9mm Luger. Like other shops of this ilk, custom departments are pretty much all the same. There is no sense of urgency, but on the other hand, all the orders are done on time to keep both management and the customer happy. Unlike one-man shops that look as if they never generate a profit, organizations like the S&W Performance Center have overhead, a building to keep and men to pay. Therefore, the work must be good, on time and make money to keep it a viable part of the company. While I was waiting, Jim Ray, Kelly's right-hand man, came out to chat, take me for a quick tour and explain the things that were going on within the shop. If the people in the shop are not building limited runs of guns for major distributors, they are adding products to the line for shooters like you and me. 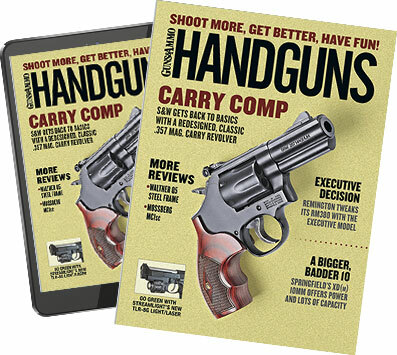 One look at the standard S&W catalog shows that presently there are more than enough variations of quality handguns to suit everyone's taste. From not-so-standard revolvers to classy automatics, the list gets longer and longer. On top of all this, the Performance Center has a long list of gunsmithing services and packages to upgrade your gun to present-day standards. The author's Mountain Gun was refinished from its original blue to polished nickel. Other custom touches by the Performance Center included new grips and a red insert on the front sight. Looking much like a large weight was off his shoulders, Tom Kelly appeared to chat about his charge. For openers, I asked him to give me the lowdown on the shop, when it was started and how the Performance Center is different from a custom shop. "In 1989," Kelly started out, "the idea was twofold." The parent company wanted an outlet within Smith & Wesson to build custom guns for customers with that need. The second reason was to support the hot Smith & Wesson Shooting Team. But after a few years of doing one-of-a-kind custom guns, the principals decided there was no real growth potential in this kind of operation, nor was there on the Third Generation pistols that seem to be the bread and butter of the custom shop. On our cover gun, the Model 945 Two-Tone in .45 ACP, custom features include the scalloped slide serrations and the long extractor. Around 1990 Kelly arrived, and discussions began about whether the company was going to change the business to something more lucrative or drop the whole idea completely. About that time the Shooting Team seemed to disappear, the company was going through hard times and the idea surfaced that to make any money and keep the men working, limited runs were suggested. What this amounted to was to make a special gun with no less than 100 units to be sold to distributors to help make the operation pay for itself. "At that point in time," Kelly went on, "one of the first men to jump to the front of the line was Lew Horton, who to this day is one of the Performance Center's biggest customers." This concept was very successful. Soon other distributors joined this network and to this day continue to request special runs of guns with various finishes, sights or odd barrel lengths. One of the most popular guns at the time was the Shorty-Forty, which was a lightweight, full-house automatic that, according to Kelly, was a real classic and something they are working on to bring back now. Additionally, the shop offered the Model 686 and Model 629, weighted hunting and competitive-styled revolvers that at that time were the mainstream products at the initial stage of the Performance Center's development. Like many of the guns coming out of the shop, this Model 945 has the trademark racing stripes on each side of the slide, which are left in their natural stainless color. The beavertail and ambidextrous safeties are standard, as are the fully adjustable sights. After the success of this phase of the operation, the Center expanded the business with other distributors and products. The most innovative and best sellers ever to come out of the Springfield plant were invented at the Center and included the entire TSW (Tactical) series and the Model 627 eight-shot revolver. The hybrid Model 945, which is basically a 1911 from the frame rails down and a Third Generation pistol from the frame rails up, is still considered one of the best .45-caliber target pistols on the market today. Equipped with adjustable sights, a crisp trigger and "racing stripes" along its flanks, it is certainly a gun to reckon with both on and off the range. Kelly went on to say with a lot of pride, "The Performance Center was the group that convinced the parent company to start manufacturing Model 1911 variations simply because that's what the market wanted. Most of the gunsmiths in the Center are all-around shooters going out just about every weekend to matches, to practice and to talk to dedicated large-caliber shooters." eight-shot revolver. The gun has a scandium alloy frame with a titanium cylinder. They were very close to the market, and as they carefully listened to enthusiasts around the county, the desire for S&W to come forward with a Model 1911 was very apparent. The only problem was that it took more than five years for this tree to bear fruit, and now the company never seems to fill the void for Model 1911 followers. Not only does the 1911 account for a large segment of Performance Center production, it is taking an ever-growing section of the regular catalog. At present, I count eight Model 1911s in the standard catalog and another four in the Performance Center section. Another part of the PC market is modern variations of guns from the past. My favorite gun in the whole S&W line is the Model 52. Shooting .38-caliber wadcutter bullets seated flush with the case mouth, I like it as both a target and fun gun. Absent from the line for a number of years, you can now purchase it as a handsome Model 952 all decked out in stainless, chambered for the 9x19mm Luger cartridge and available in a number of very distinct models and barrel lengths. There seems to be no end to the variations that can be made on any gun in the total lineup of pistols or revolvers. Some people collect just about everything they can get their hands on for investment. Others like to shoot the special variations that come from the shop on once-in-a-lifetime hunts or just on informal weekend shoots. Just recently, I used a Model 629 Compensated Hunter on a ram hunt with Smith & Wesson with excellent results. I made the shot from 35 yards with the pistol braced on a deadfall. A couple of years ago S&W brought out the big X-frame Model 500 and 460 revolvers. Now that these models are in the regular catalog, the Center is offering numerous variations. Barrel lengths are available from 6 1/2 to 10 1/2 inches with a custom barrel that now makes the Model 500 a superbly accurate hunting handgun. For the Model 460, the Center will soon have a full range of barrel lengths to include 3 7/8, 6 1/2, 7 ½ and 10 1/2-inch compensated barrels. With the introduction of the X-frame, all agree that it is an excellent addition to the revolver line, and sales have shown that it is getting to be very popular with the new breed of handgun hunter. Kelly added that while some may shy away from the 500 series because of the recoil factor, with a range of loads that are available using a 275-grain bullet, it not only is a great load for deer or hogs, it recoils less than a .44 Magnum. Before going on a hunt with Smith & Wesson's Tom Kelly, the author put his Performance Center .44 Magnum in a Ransome Rest and came up with this nice group at 25 yards with Winchester ammunition. Another factor the Performance Center is facing with the Model 460 and 500 revolvers is that the long-range capabilities of these guns are starting to exceed the handgun optics presently available. The company has contacted Swarovski and Leupold, and both are considering scopes that will tolerate the punishment yet allow the use of these high-powered revolvers to reach out to longer distances. As a side note here, it's not so much the recoil that will destroy a handgun scope, it's the torque of the gun as you fire it. Looking at the specs of just the Model 460, you are looking at a legitimate 250-yard handgun, which until present times was virtually unheard of, and yet, in optics, there really is nothing right now to take on that challenge. Swarovski does not yet make a handgun scope, but it may have the advantage of starting from ground level in both design and final manufacturing of a very rugged and durable scope. The streamlined, titanium-coated, spherical barrel bushing on the 952 is hardly noticeable at the muzzle end of the barrel. According to Kelly, he feels that the industry is very close to having all the tools necessary for the long-range hunter using such a powerful sidearm in the field. The next question was obvious. I asked if the Performance Center would consider marketing the gun, mounts and a high-quality scope as a package. Looking up as if to collect his thoughts and shaking his head, Kelly was obviously not too keen on the idea. He related packaging grips and scopes as being like "telling them whom to marry." We changed direction, and I asked what makes the Center's guns different from the same revolver or automatic coming out of the factory across the alley. In essence, the Center's guns are more specialized, the barrel setups are different, integral scope mounts are standard on some guns, forged components are part of the total package, and hand fitting is a major issue. In barrels, for instance, the Center might have its own unique twist rate. A feature that you may not know about--which started on the Model 500 and is presently available on other models--is the two-piece barrel system in which the barrel itself screws into the frame of the gun. Following that, the barrel shroud is placed over the barrel and fits into a key already machined into the frame. On top of that, the compensator is now a barrel nut locking the whole assembly in place. The user end of the Model 952 is shown here. The hammer is the type used on the old Model 52. It ends up as a barrel suspended between the two threads (one on each end), which relieves stress. Additionally, the barrel-cylinder gap, which is critical for accuracy-- especially on these high-powered revolvers--is set with a feeler gauge at the shop. The barrel and shroud are actually secured with such precision that the compensator is locked on the front shoulder of the shroud, relieving all stress and tension on the host barrel. Now begs the question: Are interchangeable barrels coming down the line? Again Kelly seemed to pick his words carefully and told me, "Not at this time," the reason being that the barrel-and-cylinder gap is too critical. If we "allow shooters using a gun with such a high-pressure cartridge like the .460 or .500 to set this gap, the likelihood of damaging the gun [possible barrel splitting] is very high because of flame cutting on the inner topstrap of the gun." There is just too much pressure and power for the average gun enthusiast to be changing barrels in the field, especially if he cannot find his feeler gauge or might have left it at home. From here we took a hyper jump to the other services that the Center will offer to those interested in enhancing their own personal gun or perhaps an older gun purchased years back. I had a Model 25 Mountain Gun in .45 Colt that I had sent in for this story, and they took care of my requests handily. The gun originally had a blue finish, and I wanted it changed to a matte nickel. They upgraded the sights, tuned the trigger and added new grips. Now I have a new gun at a far lower price than if I bought another gun with only half of the custom features I wanted in the first place. Right now the Center has five different packages to suit just about every request. There is one for the Third Generation guns that includes polishing the ramp, tuning the action, installing new magazine springs and test firing. If you have a revolver, you can have a trigger stop installed, the charge holes chamfered for easy loading, the rebound spring and hammer stud boss polished, all lockwork surfaces checked and the hammer and trigger contact areas stoned. Performance Center gunsmith Jacek Janocha is shown here assembling the barrel on a Model 500. At this point he is taking the shroud and placing it on the gun. The feeler gauge has been positioned on the frame just in front of the cylinder. For those with slightly deeper pockets, the Revolver Custom Carry Package includes more detailed work on your favorite S&W revolver, to include a bobbed hammer on double-action only and other items too numerous to mention. There is a Restoration Package for guns made since 1958 that is impressive, especially if your personal sidearm has suffered through years of holster and shooting wear. They will reblue, renickel or repolish the stainless, install new lockwork; and replace the stud as needed. Finally, for those wanting to enhance their S&W Model 1911s, there are many services available, and its best to call for specific information on that gun. The Smith & Wesson Performance Center is a fine operation dedicated to producing the best revolvers and automatics money can buy. They are meticulous in their work, the product is perfect, and they just cannot seem to produce enough of them. Oh, yes. My favorite? You guessed it: that good-looking Model 952. CAPTION A: Three representative guns from the S&W Performance Center; from left to right: the Model 945 Two-Tone in .45 ACP, the author's customized Model 25 .45 Colt and the Model 952 chambered for the 9mm Luger.